No, I do not get out every night, and some weeks I don’t get out much at all—especially when I am in that frenzy before leaving town. So for me, it was a short jazz week in town, but a very satisfying one. I missed a lot—Red Planet at the Artists Quarter over the weekend, some great local voices coming up (Charmin Michelle, Maud Hixson and Nichola Miller at the Dakota, Lucia Newell at the AQ) and the great Patricia Barber at the Dakota. But I did hear two very satisfying gigs, one of local veterans, one of a relative newcomer on the national jazz circuit. 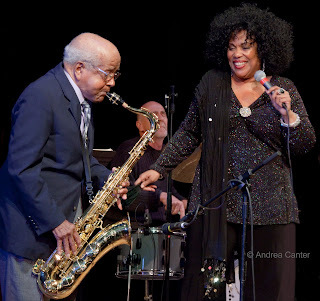 Pippi Ardennia and Irv Williams, PipJazz Sundays at Landmark Center (October 9). Hard to imagine a more entertaining evening than our Chicago transplant, sings-it-all Pippi on stage with tenacious 91-year-old sax legend Irv Williams. Pippi is always a ball of energy, whether letting it all out on her own “Love So Good” or with controlled passion on “Here’s to Life.” And Irv—he seemed to lose years with each note as if Pippi’s energy was piped into his horn, spinning with the band on “Misty” and “Moon River” before Pippi returned to the stage, insisting that they needed to repeat the latter so she could join in. Her duet with Irv on “Here’s to Life” readily recalled Shirley Horn. Irv was having so much fun, he hung out on the rest of the first set. Pippi and her house band (Peter Schimke, Billy Peterson, Jimi Behringer and Glenn Swanson) kept the energy high on the second set, but the opening voice and drums duo on “What the World Needs Now” was most enticing. Pippi and cohort Glenn continue the series in November with a focus on three young artists, covering middle school through college level. Rondi Charleston at the Dakota (October 10). You have to admire personal transformations, those inner mandates that push one to follow a muse that just won’t be silent. Rondi Charleston was no stranger to jazz or vocal music throughout childhood, ultimately earning a degree from Juilliard in classical voice and singing opera…but it wasn’t “it.” So she turned around, got a degree in journalism and became an award-winning investigative reporter for ABC. Still… that wasn’t “it.” The pull of jazz and song was too strong. Yet the instinct to search to find the story remained. Today Rondi is building a career as a jazz singer, a musical storyteller, a songwriter and lyricist. All her past comes into the present when she takes the stage. As a singer, she is still growing, and growing quickly as her show at the Dakota amply demonstrated. Over the past few years, Rondi’s voice has evolved a more rounded, more confident sound, her phrasing and timing a more personalized feel, her ever-present gift of storytelling more spell-binding. Always, she gathers a band that could easily sell out clubs and top charts on its own power—the poetic powerhouse, Lynne Arriale, on piano; music director, nimble-fingered Dave Stryker on guitar; mellow Ed Howard on bass; wide-ranging and deft Anthony Pinciotti on drums; and high-energy Mayra Casales on congas/percussion. From the opening sunshine of “Wave” to the second set closer, “Baby Don’t Quit Now,” with her own “Telescope,” “Your Spirit Lingers” and “Land of Gallilee” in between, this was a night of nonstop delights. Casales was perhaps the surprise package; and if anyone doubted the significance of a talented percussionist in a vocalist’s ensemble, “Land of Gallilee” should have ended speculation. Arriale and Stryker were commanding as soloists throughout, both particularly on “Telescope” and Arriale leading the way on the instrumental rendition of Blondie’s “Call Me.” But arguably, the most arresting moments came from the voice/guitar duet from South Pacific, “This Nearly Was Mine.” This night, really, was Rondi’s.